Fallout 4 is a fairly open-ended game in many respects, and one facet of that open-endedness that you can almost completely ignore is the creation of settlements. Settlements are small, contained communities which allow you the opportunity to draw in Settlers, provide them with homes, set up defences, and create long strings of trade routes. 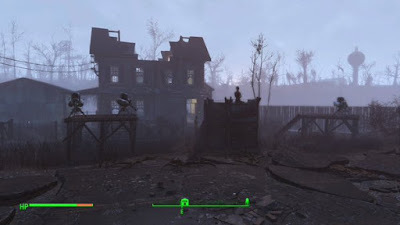 By the end of the game you can have a series of settlements that span the entirety of the Commonwealth - though doing so can take a long time, and requires a significant amount of effort on your part. In order to trigger settlement construction you must first save, and be inducted into, the Minutemen. This requires saving them from the Museum of Freedom in the quest When Freedom Calls. Once that’s done you can travel back to Sanctuary and complete the quest Sanctuary, which introduces the basics of settlement construction and operation. Completing the next quest, The First Step, will unlock another potential settlement - Tenpines Bluff - and allow you to find more such settlements elsewhere in the Commonwealth. Speak to Preston Garvey periodically to hear about more settlements. Whenever you enter the boundaries of a settlement you control you can enter Build Mode, either by interacting with that settlement’s Workshop (a red workbench) or hitting a specific button (different for each Fallout 4 platform). Build Mode forces you into a first-person view and gives you a number of construction options along the bottom of the screen. It is through these options that you construct and expand your settlements. We’ll talk about these options in greater detail below. People. The number of Settlers in your settlement. Simple enough. Food. The amount of food being generated by crops grown in your settlement. As a rule of thumb, it’s best to have at least as high a Food score as you have Settlers, if not more. Water. The amount of water available to your Settlers. The same rule as food applies here. Power. 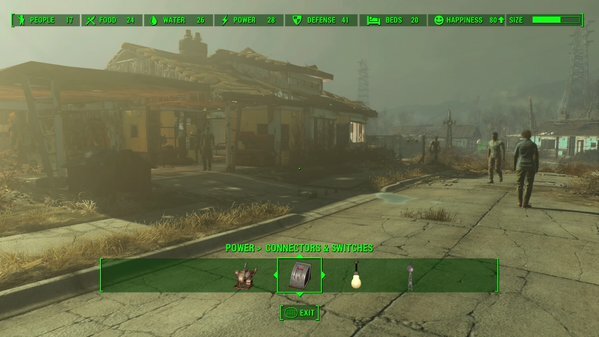 The amount of power generated in your Settlement. Power is used to turn on lights and activate certain constructs, such as defensive turrets or forms of recreation (TVs, Juke Boxes, etc.). People will generally be happier if you have electricity flowing into their settlement in various ways. Defence. The measure of your defensive capabilities. The higher this number, the less likely it is that your settlement will be attacked. Having a Defence score on par with the number of Settlers is usually enough to satisfy them, but it probably won’t be enough to keep them safe. Beds. The number of beds available. If you don’t have enough beds, people will be grouchy. You want one bed for every person, and, ideally, a few extras in case your settlement brings in noobs while you’re off doing other things. Happiness. The measure of your settlement’s overall contentment with their lives. If Happiness is high your Settlers will work harder, and you’ll be more likely to draw in fresh faces. If Happiness is low your Settlers will lolligag more, and there’s a good chance that some will drift away to greener pastures. People will come to your settlement on their own once you construct something specific - more below - and power isn’t important right away. What is important is getting the basics up and running - namely, sources of food and water, some defensive systems, and places to sleep. This is where the construction toolbar comes into play. Build Mode in Fallout 4. Note the lovely radiation storm in the background. Structures. The bare bones of the settlement. Anything required for the construction of buildings or other structures falls into this category. Generally speaking you’ll need Wood and Steel to create Structures, though many other resources fall into specific parts of this category as well. Furniture. The comfort zone of the settlement. Anything you might sit or lay upon will be found here, as well as containers, shelves, and so forth. Beds are the most important pieces of Furniture. Decorations. The fun times stuff. Decorations typically don’t serve practical functions, but they spruce up your settlements and contribute to Happiness. They’re fairly low priority when a settlement is small and in need of the essentials. Power. The stuff that requires electricity to function, as well as the stuff that grants said electricity. Most of the stuff under this category relates to either extending your electrical grid or installing lights in your settlement. Defence. The stuff what keeps your dudes safe. Everything under Defence is related to protecting your settlements, and will contribute to your Defence score. Resources. The essentials of the human body. Resources typically refer to food and water, though there are a few other items of interest under this category as well. Stores. The vendors who ring money into your settlement. Stores are more late-game establishments that can be manned by your Settlers. They will provide you with vending services that you would normally have to seek out on the road or in other towns. Crafting. The tables that allow you to build, build, build. Crafting stations are found all over the place, and through this category you can install them in your own settlements. All of the items in the above categories must, when purchased, be placed on the map, within the boundaries of your settlements (denoted by the green boundary lines around the edges). Placement in and of itself can be fun, as the terrain isn’t always willing to negotiate, and you can move items around to get the proper fit for your settlement. But before you can buy any of these things you need the raw resources to build ‘em, and that’s where scavenging comes into play. Unlike items purchased in shops, things created through Build Mode are not ‘bought’. They are, instead, crafted through the disassembling and reassembling of other items. Some items are fairly simple, and require only a few resources; some are quite complex, and may require a large number of resources to create. As such, you may need to range far and wide to get the resources you need to complete construction projects. Resources include generic products such as Wood, Steel, Aluminum, Screws, Adhesive, Ceramic, and so forth. Highlight the item you want to create in Build Mode to see what’s needed for construction. The first is to Scrap items in your settlements. When you first arrive in a settlement you’ll always find slews of detritus laying around - wrecked cars, old pots, useless light stands, trees, etc. - which can be broken down for resources. (If an item is highlighted in yellow, it’s of no use, and should be Scrapped; if it’s highlighted green it serves some purpose to the Settlers, and may be useful in its current form.) Scrapping the remains of civilization represents, especially in the first ten hours or so of building, the best way to create settlements. The second is to Scrap items you find elsewhere, whether through scrounging or purchases from vendors. Every item in Fallout 4 (except for unique items) can be Scrapped and converted into raw materials for use in other projects. If an item can be made at a workbench - for example, a gun - it must be Scrapped at that workbench; if it’s just Junk, however, it will count towards your resource count automatically, so long as it’s in your inventory or stored in the settlement’s Workbench. Once you run out of things to Scrap in a settlement you’ll be forced to scrounge other areas for useful items, then bring them back and use them in construction. The third is to create Scavenging Stations. Located under the Miscellaneous tab in Resources, Scavenging Stations will produce small amounts of Junk items every day so long as they’re manned by Settlers. More on that below. Scavenging Stations don’t produce much on their own, and are most likely to generate basic resources (Steel and Wood, most of the time), but with a large number of them you can create a fairly useful network of passive resources. Because there are so many resources it can be difficult to keep track of what you need for a particular project when you’re on the road, scrounging for Junk. If this is the case, choose the ‘Tag for Search’ option (the button’s indicated at the bottom of the screen) on an item you can’t currently build. Any resources you’re currently lacking will thereafter appear with a small magnifying glass beside their name, allowing you to quickly identify which pieces of Junk you find will be useful to your construction jobs. 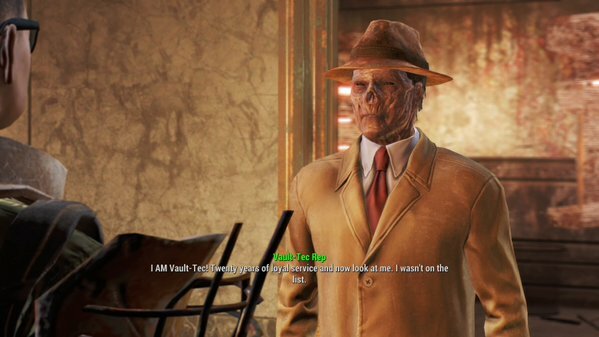 A special, potential Settler in Fallout 4. The first and primary method is to create a Recruitment Radio Beacon. Found under the Power and Miscellaneous tabs in Build Mode, Beacons will periodically draw in new Settlers when switched on. The better your settlement, the more likely you are to find new faces each time you visit. You aren’t warned when new Settlers arrive, so be sure to periodically check your Settler count via the map on your Pip-Boy. Beacons require power, so you’ll need a Generator to get one up and running. The second is to Move Settlers. In Build Mode you can highlight a Settler and choose the Move option (bottom of the screen) to send them to another settlement. The third is to find special Settlers. Occasionally you’ll come across NPCs whom you can persuade to join your settlements. Once they do they typically act as any other Settler, though some bring with them special abilities above and beyond the generics. The fourth, somewhat unofficial way to get new Settlers is to place your companions in your settlements. This is ostensibly done to make them easier to locate when you want a travelling partner, but Settlers will often help with daily chores, and are typically much better at defending settlements than normal Settlers. They also don’t count against your Food and Water scores, and won’t require beds. Win-win, really. Once you have Settlers wandering around your settlements you need to give them something to do. You can accomplish this by highlighting a Settler in Build Mode, clicking on them, and then clicking on whatever it is you want them to do. If you need a Settler to man a Scavenging Station, for example, you’ll have to click on them, then click on the Scavenging Station. They’ll scavenge until you give them something else to do. If you don’t give a Settler orders they’ll either tend to food items, assuming any are available, or just loiter around until something attacks your settlement. It should be noted that Settlers can’t die, or at least not as far as I’ve seen. A Settler that gets attacked enough will simply fall down for a while. They can still leave your settlements if they’re pissed, however, which leads us to the all-important topic of defending your settlements. The Settlers themselves. Whenever there’s danger Settlers will pull out a gun and rush to confront whatever’s attacking them. As such, so long as you have at least one person in a settlement, you will have a source of defence. Settlers on their own do not contribute to your Defence score unless you have them manning a Guard Post, however. Turrets. You’ll run across Turrets all the time while exploring Fallout 4, and you’re free to create your own and post them at strategic points around your settlement. They will activate automatically and attack anything hostile that comes within their range. Basic Turrets do not require power, but ore advanced models may need electricity to operate. The stronger the Turret, the more it adds to your Defence score. Traps. Similar to Turrets, Traps can be set up at strategic points to eliminate enemies, and properly deployed they can be extremely effective. That said, Traps will hurt everyone, not just the baddies, and trigger so long as they’re being supplied with power. It’s wise to attach Traps to switches so you can turn them on and off whenever bad guys are in range. I don’t recommend Traps unless / until you have a good bead on construction, and know how to safely isolate them from yourself and your Settlers. The settlement can be threatened with an attack. In this case you’re given time to build defences, and once you reach a certain threshold enemies will begin an assault. One of the Settlers can be kidnapped. You’ll either have to pay a random or head off to a random location to get them back. Occasionally this will happen to a friend of a Settler instead, in which case retrieving them will earn you another new Settler. This counts as a quest, so you’ll get experience and caps for helping out. A random base of enemies will start picking on your settlement. The Settlers will appeal to you to raid an enemy base and clear it out for them. Again, experience and caps are forthcoming for your services. Your settlement will want to expand. This is basically just a quest to clear out an emptied area and turn it into a new settlement, but it’s still on a timer, and it still involves killing stuff. Even if your Defence score is high, you’ll get a lot of these requests once you’ve established a lot of settlements. Have fun! 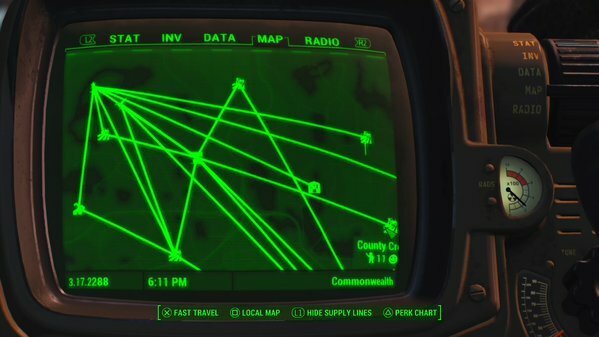 A string of Supply Lines in Fallout 4. All of these settlements have connected resources, many needlessly so. By this point you have a fairly good bead on what it means to operate settlements. There’s only one more topic that really needs discussing, and that’s Supply Lines. As your settlements run out of raw materials laying about in the periphery they’ll need other sources of Junk to continue building, and though Scavenging Stations can help, they aren’t great. The solution is to establish Supply Lines between your settlements. First, most important, those two settlements will now share resources. Anything located in the Workbench of Settlement A will similarly be available to the Workbench of Settlement B, and vice versa. As such, you can use one settlement as a primary resource dump, then connect every other settlement to it, thereby sharing all of your resources between your settlements. Third, your Settler won’t appear in their settlement very often. That said, they still count as a Person, still take up Food and Water, and still require a bed. You can change them back into a normal Settler by clicking on them in Build Mode and reassigning them to something else. Supply Lines are absolutely vital if you plan on creating lots of settlements, as it’s just not feasible to collect separate resources for every freakin’ settlement. Pick a central settlement, then connect the rest to that settlement. By doing so you’ll make resource allocation much easier, and, assuming each settlement is only connected by a single Provisioner, you won’t clog up your Settlers with restless, stupid Brahmin. They’re adorable, but man are those cows annoying. So what’s the end goal of settlements? Practically speaking, it’s to pull in merchants. You’ll notice fairly early on that Trashcan Carla likes to linger in Sanctuary, and once you branch out you’ll probably find other travelling merchants doing the same at your other settlements. This makes them a great way of accessing good weapons, armour, and other services that would normally only show up randomly while you’re on the road. Beyond that and some storyline purposes, though, settlements are mainly for fun. Building stuff is an absolute joy, and they give incredible purpose to all those Junk items that have uselessly clogged Bethesda games up to this point. They’re also great for creating war-like situations, as you can get into some epic battles when large forces raid your settlements, and the resulting loot is nothing to sneeze at.